Sources: Gollon Brothers is currently raising Mudminnows, with some wild harvesting to meet demand. All Year. Supply can be limited at times. The Mudminnow can survive without aeration - it is able to "gulp" air, absorbing the oxygen through its swim bladder. 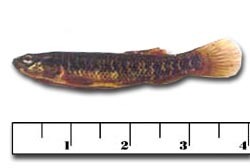 The Mudminnow can tollerate warmer water temperatures than other baitfish.